One good alternative for new photographers is to start out in the Creative Auto (CA) mode. It’s very similar to Full Auto, so it’s something you might want to use in moderation, but you do have a bit more control over some of the settings. You have the ability to change the brightness, background blurriness (aperture), and Picture Style of each image, along with your quality setting and drive mode. The camera will decide the rest for you. It’s a good option if you know what you want your image to look like but are still not familiar with how aperture and shutter speed function to properly expose your image. For example, if you know that you want to photograph a person with a blurred background, you can do this very easily in the Creative Auto setting (Figure 3.1). The camera will know where to set the aperture to give you the effect you want. This mode is still limited because you are not able to change your white balance, ISO, focus point, and shutter speed. Keep reading to explore the more advanced shooting modes— this will ultimately give you full control over the images you create. 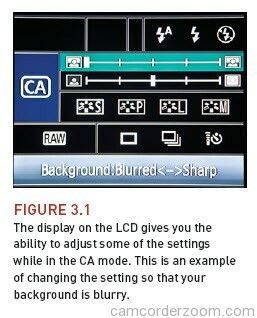 Turn your camera on and turn the Mode dial to align “CA” with the indicator line. The display on the LCD will automatically turn on, allowing you to change some of your settings. To make changes, press the Quick Control button and use the Multi-Controller to toggle between the settings. Then use the Quick Control dial to make your adjustments. When you’ve fi nalized your settings, point the camera at your subject and press the Shutter button to take a photo. One important detail to know when using the Full Auto and Creative Auto modes is that your menu tabs are limited. Only seven out of the eleven tabs that are normally visible when shooting in all other mode settings will display (Figure 3.2). 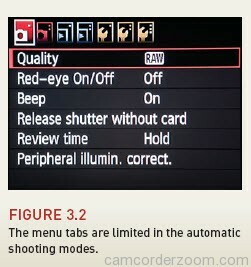 Because in fully automatic modes the camera decides the majority of the exposure and color settings, the information in some menu tabs is not necessary.